The Tennant S20 is a Mid-Sized industrial grade, self-propelled, ride on sweeper, manufactured in the U.S. The S20 can be configured for use in indoor or outdoor environments. For ultimate flexibility the S20 is available in four versions: Gas, LPG, diesel, and electric. The S20 battery-powered sweeper features fume-free, quieter operation and low maintenance. The Tennant S20 ride on sweeper picks up all debris from fine sand to light litter on almost any surface. The side broom on the S20 ride on sweeper directs debris into the path of the main broom. The S20 main broom throws debris forward from the floor in to the debris hopper. A large vacuum fan pulls dust into a highly efficient three stage dust control system called “SweepSmart”, and clean air is exhausted. At the recommended operational speed of 5.0 MPH the S20 ride on sweeper cleans at the rate of 96,600 square feet per hour. Debris hopper on the S20 industrial ride on sweeper can be emptied at any height up to 60 inches. At full capacity the S20 industrial rider sweeper debris hopper can hold up to 11 cubic feet of debris. A hydraulically controlled rear hopper door contains debris during transport. 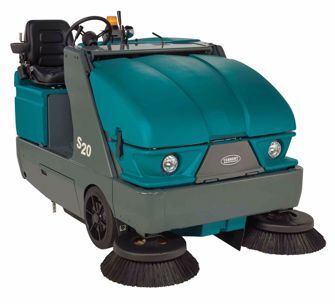 The S20 ride on sweeper is available with optional dual side brooms for a category leading 62 inch cleaning path. Add the optional vacuum wand and clean tight corners and hard to reach areas. Other popular options for the S20 are the rotating hazard light, and overhead guard. The Tennant S20 Parking Lot floor sweeper, especially the gas, LPG, and diesel options, is an ideal floor cleaning machine for outdoor sweeping in parking lots, grounds, and garages. Parking surfaces are home to excess gravel and dirt, along with nails, screws, broken glass, and more abrasive debris which affect the condition, safety, and appearance of your parking space. With the help of the Tennant S20, you can efficiently maintain your parking lot to preserve its strength, quality, and safety for years to come.